At a time when many great trout rivers suffer from sagging fish populations and burgeoning angler interest, one major river does not. Northern California's lower Sacramento River (known locally as the Sac or lower Sac) has strong populations of heavy-bodied wild rainbow trout, and anglers enjoy better fishing now than at possibly any time in the past 35 years. The fish grow large, the angling pressure remains within realistic limits (far below the numbers of anglers competing for space on more famous, yet less productive, trout streams) and access to this great fishing is convenient, as the river carves its way through the city of Redding. What magic transformed this river to its present status? Salmon. Major efforts to improve the once legendary runs of now endangered Sacramento River Chinook have also enhanced one of the West's best year-round trout streams. The upper Sacramento, McCloud, and Pit river systems (including the Fall River and Hat Creek) all merge into Shasta Lake. The lower Sacramento River flows out of this vast reservoir and bisects the city of Redding before continuing south into the Sacramento River Delta and eventually San Francisco Bay. Redding, with a population of 90,000, is a community dedicated to piscatorial passions, with trout pictured on the restroom tiles in city hall, and a 40-foot sculpture of a fly fisher netting a trout gracing the building's front lawn. The lower Sacramento is just one of the many fabled trout waters near Redding. The creation of Shasta Dam (and Keswick Dam, a smaller, secondary impoundment below Shasta and just above the city of Redding) in the mid-1940s blocked anadromous fish passage and warmed the water, making it inhospitable for salmon and steelhead. To mitigate the effects of the dam, a temperature control device (TCD) installed at Shasta Dam in 1997 allows the Bureau of Reclamation to precisely control the water temperature of the outflow. The TCD pulls water from different depths of Shasta Lake in order to ensure optimum temperatures for spawning Chinook salmon and their offspring. The target temperature is 56 degrees F. at the Red Bluff Diversion Dam, 49 miles downstream from Keswick Dam, effectively guaranteeing water temperatures from 51 to 55 degrees in the upstream stretches near Redding. Today the Sacramento is the only river we're aware of with four distinct runs of Chinook salmon: fall, late fall, winter, and spring. The winter run was nearly extinct before the completion of the TCD, reaching a historic low of 186 returning fish in 1994. By contrast, the recorded run in 2003 was more than 9,000. On top of improved salmon returns, regulated tailwater temperatures have extended the lower Sac rainbow trout fishery farther downstream and helped to bolster aquatic insect hatches. The lower Sac, originally known for its caddis hatches—specifically Brachycentrus (grannom) in the spring and Hydropsyche (spotted sedge) all summer long—now supports Baetis mayflies, which are common on overcast days through the fall and winter; Little Yellow Stoneflies and PMDs in the spring and summer; midges year-round; a few Salmonflies and Golden Stoneflies; and even Hexagenia mayflies. The nature of the lower Sacramento is ever-changing. Flows from the dams fluctuate through the seasons, sometimes without warning. The hatches on the river constantly shift, and water and weather conditions make predictable dry-fly opportunities scarce, though they do exist. Combined, these factors make the lower Sac difficult to learn, especially through the varying seasons. Hiring a competent local drift-boat guide is beneficial to understanding the water. Although wade-fishing opportunities appear at times of low flows, drifting the river is the most efficient way to find fish year-round. Nymph rigs produce fish more reliably. Michael Caranci Photo. In spite of increasingly better insect hatches, the lower Sac remains predominantly a subsurface fishery. Consistently rising trout are a pleasant anomaly rather than an everyday event, making the river difficult for newcomers to master. Locals break it down by dividing the large river into small, recognizable elements. "Look for edges and drop-offs, and good cobble bottom with decent depth rather than areas with shallow, sandy bottom," says lower Sac guide Ernie Denison. In a recent barroom discussion, he was quickly countered by fellow guide Lonnie Boles: "Yeah, but you can't forget about the salmon redds, either." The importance of salmon to lower Sac trout cannot be overstated. When salmon are spawning, their redds—or spawning beds—offer crucial clues to finding the trout waiting downstream to ambush wayward eggs and dislodged aquatic nymphs. Fall on the lower Sac provides consistent trout fishing. Predictable low flows provide limited wade-fishing opportunities in and around the city of Redding. The flows on the river drop from high summer discharges averaging 15,000 cubic feet per second (cfs) to around 6,000 cfs by the middle of October. Ideal wading conditions occur at flows below 7,000 cfs. Autumn signals the arrival of the largest of the four annual Chinook runs. The first salmon of the season roll in the deeper pools during the early breaths of fall, and congregate in shallow gravel at the tailouts of long flats and at the heads of heavy riffles. Where there was once smooth gravel, obvious speed bumps appear under the water, providing road maps to where the female salmon have moved hundreds of pounds of gravel by thrashing their powerful tails against the rocks. As the salmon build their redds, they dislodge hundreds of caddis, mayfly, and stonefly nymphs, not to mention the high-protein eggs that frequently drift downstream. Trout await the arrival of the big anadromous fish. Like the salmon, they lie in the deeper slots and channels during the heat of summer. But as soon as the salmon move into the shallows, the trout follow. Several footbridges within the city limits of Redding offer views of this phenomenon: a big rainbow trout—often over 20 inches—lurks downstream of a spawning female salmon, dodging left and right periodically to grab a tasty morsel drifting past. These small dramas take place throughout the lower Sac in the fall and winter months, and they guarantee one thing: wherever the salmon are spawning, big trout congregate just downstream. The number of anglers on the lower Sac dwindles in the winter, but the quality of the fishing doesn't. Salmon remain in the river between the tail end of the main fall run and the beginnings of the late fall run. Spawning continues through this time period, sending insects and eggs downriver to hungry trout. These trout have been gorging on a high-protein diet for a couple of months now, and many of the heaviest trout of the year are caught during the winter. Winter flows often remain low, providing more opportunities for wade fishing. Occasional storms may blow the river out, but the water typically clears within 24 to 48 hours after the downpours cease. Another important change for the river ecosystem begins during this time of year, known locally as the alevin hatch. Alevins, the tiny, yolk-carrying salmon fry that hatch after the eggs have incubated for approximately 50 days, provide another important source of food for lower Sac rainbows. Although there are still plenty of fresh eggs drifting downriver at this time, the trout often prefer alevins when they're available. Since they are not yet able to swim effectively, try dead-drifting alevin patterns such as a Mercer's Sac Fry just as you would an egg or nymph pattern. Winter weather ranges from sunny and mild to heavy downpours to the silent stillness of calm cloud cover. Those gray, drizzly, miserable days often provide the best conditions for fishing. Overcast skies make both the salmon and the trout more comfortable in the shallow water the salmon use for spawning. The fish get excited by those drizzly winter days—as do Baetis—providing the best odds of finding trout sipping these tiny drys. As the hills turn vibrant green, and trees all across the state burst their buds, the lower Sac begins to change as well. The first major shift occurs with the color of the eggs you use. During the fall and winter, orange and pink salmon eggs make up the the bulk of the trout diet. In the spring, trout, pikeminnow, and suckers start to spawn, and yellow egg patterns work best. Winter-run Chinook are still spawning in the river, but not in the same numbers as the fall and late fall runs. Spring on the lower Sac is also known for "March Madness." Grannoms, more commonly known as Mother's Day caddis, begin to hatch by the millions, providing some of the best dry-fly days on the river, and even more productive nymph fishing with emerging caddis pupa imitations. These caddis prefer to hatch on sunny, warm days, and often disappear completely for days at a time while a cold front moves through. On good days, there can be literally too many bugs. The fish have so much food to choose from that getting them to take your imitations requires more than casting prowess or fly selection. The "X" factor for the springtime, however, is the water and weather conditions. Heavy spring downpours, especially when combined with heavy snowpack in the mountains, have the potential to blow the river out. The section near Redding does clear quickly, and as soon as the flows drop, fishing often turns on again. By May, river flows start to increase, with the dams pumping as much as 15,000 cfs to irrigate the agricultural lands of the Central Valley. Days grow longer, and air temperatures rise steadily, hitting midsummer levels of more than 110 degrees at times. But on the river, consistent cold water releases create a cooling effect that comforts sunblock-soaked anglers as well as ensuring a healthy habitat for rainbow trout. Brachycentrus hatches (#16) typically taper out by late April or early May, soon replaced by the larger, tan-colored Hydropsyche (#14), which hatch all summer long in the evening hours. The consistency of these daily caddis hatches guarantees relatively reliable fishing throughout the summer. The morning hours, though comfortably cool, often fish slowly, with the real action rising with the mercury at midday, as the caddis pupae begin to move underwater. Nymphing with caddis patterns and small mayflies remains the staple all summer long, with good possibilities for dry-fly fishing to emerging caddis during the last two hours of daylight. From early June through July, American shad (Alosa sapidissima) migrate upriver, reaching as far north as Red Bluff. These hardy, silver-scaled specimens are found by the thousands in the river. Shad, averaging 2 to 5 pounds and often referred to as "poor man's tarpon" are known for two things: steady, powerful fights and amassing in large numbers. Once you've located a school of shad, swinging flies on sinking lines produces fish after fish. Choosing the proper line is often more important than fly selection. Shooting heads, RIO VersiTip systems, or integrated sinking tips all work. The key is to have a variety of different sink rates. For slower, shallower water, a 150- to 250-grain tip is ideal, getting the fly down to the fish without hanging up on the bottom. For deeper, swifter currents, use a heavier sinking line (300- to 500-grain) to keep the fly in the strike zone. There are differences of opinion regarding shad presentations. Typically, the fly is cast quartering across and downstream, and swung across the current on a tight line, similar to a traditional wet-fly swing used for steelhead. However, some guides argue it's more productive to jig the fly by pulling on the fly line with the stripping hand every few seconds as it swings across the current. 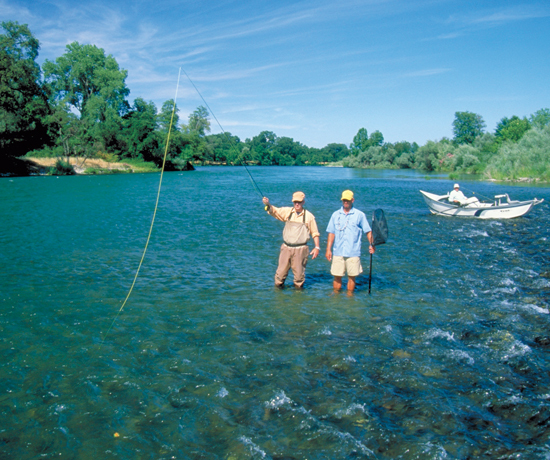 It's generally known that the lower Sac in and near the city of Redding provides consistent fly-fishing opportunities. But a well-kept secret resides in the river below Redding: more than 50 additional miles of fishable water from the town of Anderson as far south as Tehama. Formerly too warm for good trout fishing, these now cooler waters host ever-increasing numbers of wild rainbows. Daily sightings include blue herons, ospreys, snowy egrets, bald eagles, wild turkeys, deer, otters, coyotes, and even the occasional beaver. The river undergoes many key changes as it carves its way southward through the Central Valley. In places, it slows and widens, only to drop into raging canyons where it narrows and boils, providing everything from spring creek-style dry-fly fishing to high-stick, pocket-water nymphing, which is best accomplished from the comfort of drift boats. The constantly changing landscape—golden rolling grasslands, black volcanic boulders, and jagged red cliffs—casts ruddy reflections on stretches of river such as Massacre Flat and China Rapids. The lower portions of the Sacramento River hold heavy trout, as well as bigger, meaner, Central Valley steelhead. These anadromous fish average 3 to 8 pounds, but can grow up to 15 to 20 pounds. The first of these seagoing rainbows appear as early as Labor Day, with the bulk of the run making its way upstream throughout October and November. The steelhead fishery on the lower Sac is still relatively unexplored. Most guides on the river target steelhead using the same gear, rigging methods, and often the same flies that they already use for trout. Of course, there are certain types of water that hold steelhead with more consistency: tailouts above broad rapids, big boulder-strewn runs, and the inside seams of riffles, to name a few. Steelhead are no strangers to salmon redds, either, often holding in the shallows just downstream from spawning salmon. Increasingly, anglers are exploring the Sacramento River with more traditional steelhead tactics, swinging wet flies across the runs and riffles in search of that one electric grab. The vastness of the Sacramento makes it ideal for Spey rods, which are swiftly growing in popularity among the few tight-lipped locals who have discovered the Sac's swingin' steelhead fishery. That winter day, as on countless others, I cranked the drift boat up onto the trailer as darkness descended all too swiftly. We had seen no other anglers as we drifted right through the heart of Redding. More important, we had hooked plenty of fish. There's really no bad time of year to fish the lower Sacramento River, just differing conditions. In fact, any angler who really wants to get to know the river should experience it throughout each season. Each season presents a wonderful opportunity to visit the river, and traveling anglers who sample the Sac will revel in the charms of this world-class fishery. John R. Gantner lives in Redding, California, where he teaches fly-tying classes. Michael Caranci is the director of outfitters for The Fly Shop in Redding.